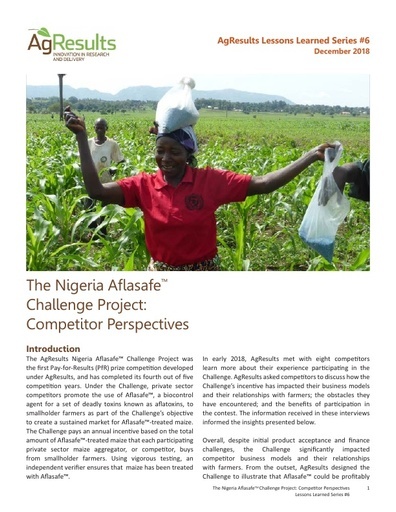 The Nigeria Aflasafe™ Challenge Project is a 5-year, US $12.68 million Pay-for-Results prize competition that incentivizes private sector actors to work with smallholder farmers to adopt Aflasafe™. AgResults offers a per unit payment premium to aggregators and grain traders for each metric ton of high Aflasafe™ maize (i.e., maize grains containing high proportion of beneficial fungi). By motivating smallholder farmers to use Aflasafe™ and providing technical assistance, aggregators help smallholder farmers to produce high-Aflasafe™ maize that is aflatoxin free. Encouraging farmers to apply Aflasafe to their maize has economic and health benefits. Aflatoxin contamination affects 4.5 billion people across the developing world. Among the most carcinogenic substances known, aflatoxins are produced by a group of molds known as the Aspergillus fungi that are commonly found in grains such as maize. In Nigeria, where smallholder farmers produce over 70% of the nation’s maize crop, it is estimated that a high percentage of the nation’s maize is contaminated by aflatoxin. Technologies to combat aflatoxin contamination have been sought for decades. In Nigeria, an environmentally safe technology to reduce aflatoxin contamination of crops has been developed using beneficial fungi that displace toxigenic fungi. This technology is called Aflasafe™. However, various barriers to market, including consumer awareness, affordability, and a lack of contamination limits, amongst other reasons, have prevented its widespread adoption. Private sector aggregators and grain traders who provide AflasafeTM to smallholder farmers in order to obtain better market prices and quality. Competitors receive US $18,75 per MT of AflasafeTM-treated maize sold. The maize must have at least a 70% AflasafeTM level. Laboratory testing verifies the prevalence of Aflasafe in maize in order to provide payments. As designed, the project is expected to sustainably engage the private sector (maize aggregators) in the supply of aflatoxin-free maize, and raise awareness of aflatoxins as a problem and Aflasafe™ as an effective control. The increased awareness in turn is expected to result in increased demand for aflatoxin-free maize by smallholders and value chain actors resulting in improved health outcomes from consuming safer maize. Smallholders are also expected to benefit from increased yields and increased market demand and/or any direct financial incentives that maize aggregators provide them. 480,000 MT of high-AflasafeTM maize and lower aflatoxin levels. An estimated US $270 per hectare per year economic benefit for smallholder farmers. Improved health benefits for over 70,000 smallholder farmers and their families. This table illustrates how our learning has evolved in Nigeria from project design through implementation. Further details can be found in the Learning Library. Below are recent learning products related to Nigeria. 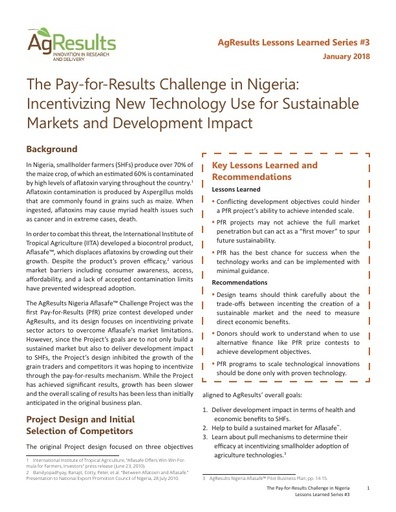 In Nigeria, the Evaluator originally designed a randomized control trial but because of lack of adherence to the randomization, used a quasi-experimental impact evaluation design. We compared smallholders in villages that AgResults reached, or the treatment group, to a comparison group of smallholders in villages that AgResults did not reach, focusing on the zone of influence of six implementers in northern Nigerian states of Kano and Kaduna with additional non-treatment farmers being drawn from a set-aside area in Katsina state. 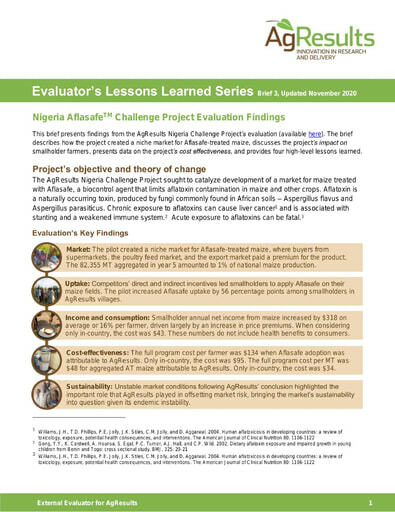 To assess impact of the project on market for aflatoxin-free maize, the Evaluator is applying a structure-conduct-performance analytical framework (further described in the Evaluation Framework). The Evaluator carried out the baseline before the 2015 planting season and completed the endline survey before the 2017 planting season one year before the planned project end to allow program expansion into areas that had been set aside as comparison areas. In 2017, the project was extended by one year, with reduced incentives. A final qualitative inquiry is planned at the end of project in 2019. Evaluation findings are forthcoming. Debo Akande is the Country Lead for AgResults Project in Nigeria. He holds Bachelor’s and Master’s Degrees in Development Studies from the United Kingdom and Diplomas in Agribusiness management and International Environmental Law, from Nigeria and Switzerland respectively. He is a United Kingdom-qualified Chartered Fellow Manager as well as a Doctoral Researcher of Agribusiness Management at the University of Hertfordshire, United Kingdom. Mr. Akande is also a Senior Scientist with the International Institute of Tropical Agriculture (IITA), with over 15 years of international development management experience. Ranajit Bandyopadhyay is a Principal Scientist (Plant Pathology) with 38 years of agricultural research and development experience in Asia, Africa, and the Americas. He holds a PhD in Plant Pathology from Haryana Agricultural University in India. After working the International Crops Research Institute for the Semi-Arid Tropics (ICRISAT) in India, Dr. Bandyopadhyay joined the International Institute of Tropical Agriculture (IITA), Ibadan, Nigeria where he founded the Africa-wide Aflasafe initiative and has been guiding research, tech transfer, commercialization and scaling-up of the aflatoxin biocontrol technology Aflasafe in 17 African nations. He has received several international recognitions for his work.